Parliamentary Reform Meeting with Ahmed Hussen. 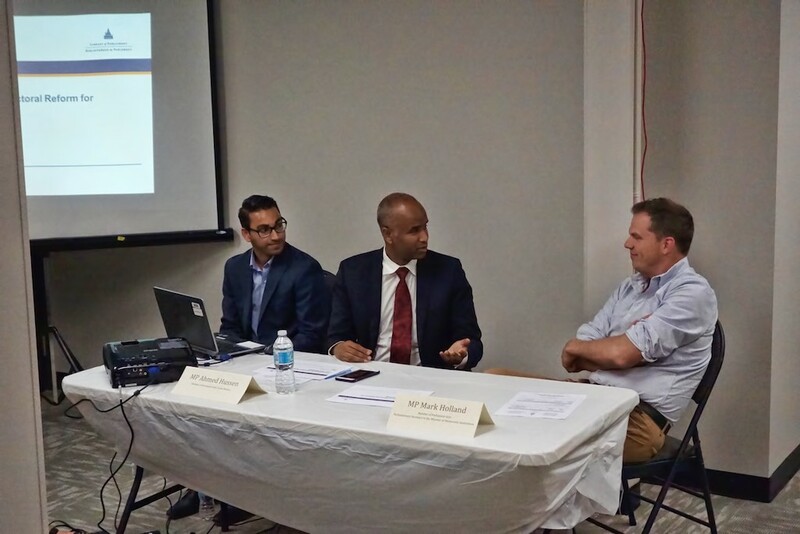 MP Ahmed Hussen (centre) and MP Mark Holland (right) discuss electoral reform with constituents August 10, 2016. Almost 30 residents attended yesterday’s consultation meeting at the 99 Milvan Drive office of York South-Weston MP Ahmed Hussen. Parliamentary Secretary to the Minister for Democratic Institutions, MP Mark Holland presented the various alternatives to ‘first past the post‘ elections and then the floor was thrown open to residents’ comments. One thing is clear from the meeting; electoral reform is coming. Currently a non-stacked parliamentary committee is studying the matter. Input from ridings around the country will help determine the best alternative to the current system. Author Roy MurrayPosted on August 11, 2016 Categories Ahmed Hussen, Federal Election, PoliticsTags Ahmed Hussen, York South Weston3 Comments on Parliamentary Reform Meeting with Ahmed Hussen. Ahmed Hussen, our new MP, took a some time to speak with me about his new job and his priorities in the upcoming parliament. Jobs, jobs, jobs… Jobs, affordable housing, transit, and pensions. We have promised to increase the [Guaranteed Income Supplement] by 10%, to open up the cost of living index for seniors to make it fairer. But there’s no doubt that the top priority is jobs. First is cutting taxes for the middle class. The second way is the child tax benefit—all the folks who have children who make under $200,000. That’s going to put more money in people’s pockets. The third way to create jobs is all of these investments in infrastructure. Finally there’s a commitment to create youth jobs. That’s money we can fight for to create jobs for youth in York South—Weston. We are [also] part of the city of Toronto. The $20 billion that the Liberal Party has promised, part of it will go the the city. My job is to make sure is to make sure that York South—Weston gets its fair share. That means working with the other representatives. Hussen has drawn criticism for not living in the riding, so I asked him about it, and his answer surprised me. I had a law office [in Weston, and] I have been involved in the Weston neighbourhood for a really long time. I used to play soccer in the field across from the Hickory Tree apartments. The other thing is, I would love to live in the riding. I love the community. [But] I have two kids, and I’m a relatively new lawyer. I’m not someone who is living in a rich neighbourhood who is coming into York South—Weston. I picked the least lucrative field in law. (He is in immigration and criminal law.) When people say “you don’t live in the riding, you think you’re too good for us”, that’s not the case. If I could buy a home, I would. I’m not the typical rich guy who was parachuted into the riding. I have to say, although I did not endorse Hussen for the candidacy, having spoken with him at some length, I feel much more enthusiastic about his election. He seems genuine and energetic. In addition to appearing on this illustrious website, Hussen also made it to the CBC. Thanks to Suri for the tip. Mike Sullivan posted a farewell letter that slipped right by me somehow. It’s worth the read as a review and a caution to the MP elect. After arriving alone as a 16-year-old refugee from Mogadishu, Hussen completed high school in Hamilton and then moved in with one of his brothers, who had secured a subsidized apartment in Regent Park. A backlog in refugee applications for permanent residency meant that Hussen couldn’t qualify for a student loan. So instead of waiting for his papers, he got a job and spent more than a year commuting nearly two hours to pump gas at a station in Mississauga, where he was paid $6.85 an hour. “The fact that I lived in public housing was crucial to being able to save for university,” he said in an interview with Star Touch.